The Falcon Dental Group site is an incredible example of elegance, professionalism, and a welcoming air all rolled into one website design. Combining these elements in a way that still said ‘family practice’ to the viewer was a challenge to be met, and in the end, we’re quite satisfied with the results, as is the client. It was clear from the beginning that Dr. Falcon had a very specific image he wanted to put forth for his future clients that included a clean and professional atmosphere with an old-world family feel. We approached this decision carefully and coordinated our efforts to reach that goal. The result was a sleek website that showed our web design talents to their best advantage, and leveraged contrast, effective design, and marketing into one synergistic whole. Once we realized that the best foundation for this goal had to be built on black with its air of sophistication and elegance the rest came easily. White was going to play a role in the color palette, as it does in almost every design, but the decision to include a golden brown in the equation was daring and brought the whole design together. 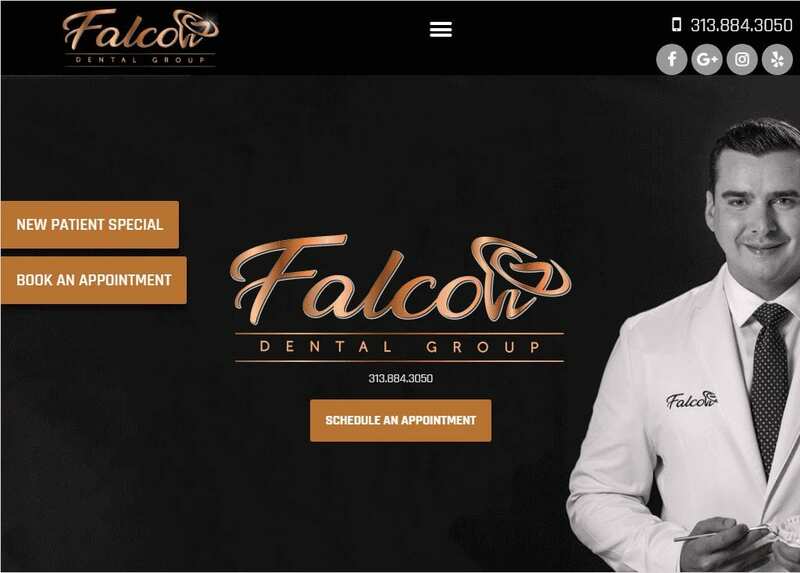 • Contrast – The Falcon Dental Group’s website is a practice in subtle and stark contrasts are present in equal measure, composing a beautiful tapestry throughout the website. White contrasts beautifully with the golden brown color, as well as perfectly contrasting with the white. • Action Oriented – The Golden Brown has just enough of the energizing reds and oranges in it to stimulate action in the viewer, making the logical choice for the buttons found throughout the site. This site used some of the most common design techniques to create an artful site that maintains the sense of style and dignity that its creator was looking for. • Space – This website makes excellent use of space and ensuring that the viewer is able to access the information they’re looking for with ease. The background is expertly divided between dark backgrounds and light imagery combined with scrolling information in a convenient format. • Navigation – Ever present throughout the site is the header that contains the hamburger menu, social media information, phone number, and name of the Falcon Dental Group. At any point during their visit to the site, the customer is just one or two clicks away from anything they need. • About Us – Information about the Doctor himself is readily available on the home page, but links to the sites About Us page provides further information about his staff and office. • Contact Information – Having your contact information prevalent throughout the site is vital to driving conversion in your visitors. Making information difficult for your visitors to find greatly increases the odds that they’ll lose the impulse to make that appointment. • Information Forms – Information forms like appointment requests and review portals should preferably have a limited number of fields to fill out. The one on the Falcon Dental Group’s site has four simple entries, Name, Email, Phone, and a Message for the receiver. Simplicity itself. This website speaks of dignity and sophistication in a family oriented business, a business that focuses its goals on ensuring that expert service is provided while maintaining a dignified family air. This kind of build is perfect on businesses that rely on their sophistication and timeless natures to connect with their local clientele.